This is just...too weird. Warner Bros. has apparently figured out how to, after nearly two decades of prominence in the States, concoct a live-action Pokémon movie that actually looks nothing like I would have imagined the first live-action Pokémon movie would look. That said, I don't remember much about the whole Pokémon boom of the late nineties other than the fact that the show was mildly entertaining as were the Game Boy games and I never got that damn holographic Charizard card. I'm not necessarily a big fan of the brand, but I was able to get into it for a little bit when everyone else was given I was in junior high at the time and all anyone was doing was playing the new N64 games Nintendo and The Pokémon Company were pumping out. How the brand is still viable so long after it catapulted into the zeitgeist twenty years ago is beyond me (and no, I didn't play Pokémon Go a couple of years ago), but as these things go it's clear as to why WB and Legendary would partner with The Pokémon Company to bring these monsters to life for the first time: global appeal, global dollars. Still, POKÉMON Detective Pikachu doesn't exactly seem the obvious route to go. The film is apparently based on a spin-off game that came out a few years ago in Japan. The Japanese version had an older, deeper voice actor performing the role of Pikachu, but for this Americanized version we have Deadpool himself, Ryan Reynolds. To hear this very distinctive voice coming out of this well-known character is a bit disorienting to be sure, but it will be interesting to see if Reynolds can condition audiences to look past his voice and believe it really is the character of Pikachu rather than Reynolds in a booth somewhere. The film concerns itself with an ace detective, Harry Goodman, who goes missing thus prompting his son, Tim (Justice Smith), to find out what happened to his father. The trailer tells us Tim is the only one who is able to actually understand Pikachu and thus the two of them partner up as Pikachu assists in Tim's investigation; the two of them piecing together clues through the streets of Ryme City. 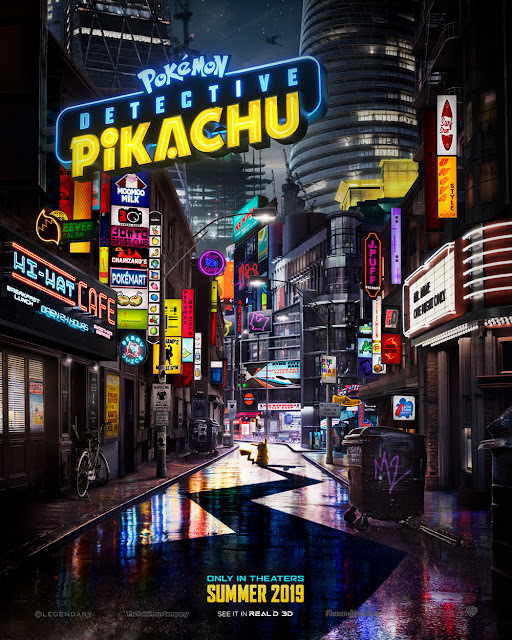 POKÉMON Detective Pikachu also stars Kathryn Newton, Ken Watanabe, is directed by Rob Letterman (Goosebumps), and opens on May 10th, 2019. Synopsis: Fans everywhere can now experience Pikachu on the big screen as never before, as Detective Pikachu, a Pokémon like no other. The film also showcases a wide array of beloved Pokémon characters, each with its own unique abilities and personality.